I am so totally crap at covering the bicycle infrastructure in provincial Denmark quite simply because I rarely get out there. The opportunity arose a week ago when we motored out to the country in our car share car, to spend some time with all the kids and parents in my son's school class. Just as in Holland and many regions of other European countries, there are bike lanes pretty much everywhere. They vary in style and placement, depending on the amount of traffic they get. If you're really out in the boondocks, you may be stuck for separated lanes, but between most towns there are either lanes on each side of the road or, like in the photo above, a two-lane bike lane running parallel to the road. This bike lane runs between two towns. One with a population of 4000 and the other, 15,000. It is a part of the regional and national bike lane network. Roughly 10,000 kilometres in all. 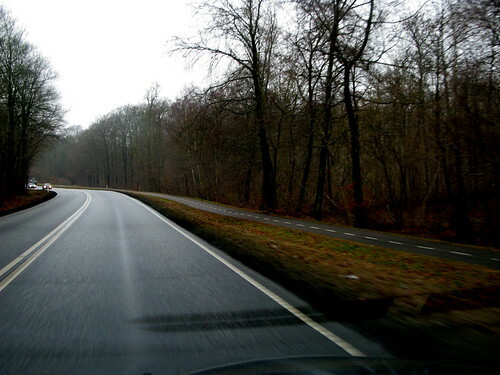 The respective county is responsible for upkeep of the lanes in its area. Such lanes are primarily used for transport, kids going to school or adults getting from A to B. As in Holland, it isn't permitted to build any new roads or housing developments in the nation without including bike lanes and facilities in the planning. 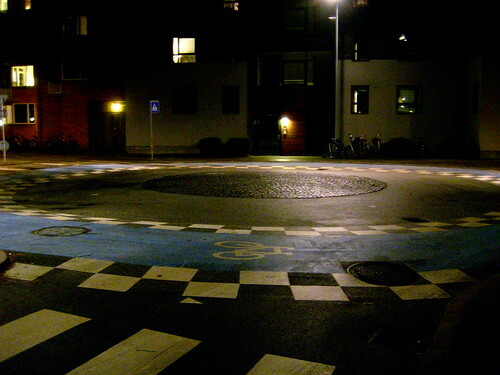 Meanwhile, back in the city, I love this little roundabout near our place. You're not really in any doubt that bicycles have the priority here. The bike lane is raised up in a kind of circular ridge, which doubles as traffic calming for cars. tags: "bike culture", "bike infrastructure"